The 'InfoStra' technical study carries on engineering consulting in all Italian area, above all in Friuli Venezia Giulia and all Nord-Est area, and works with Court Judges, Attorney-General offices, Justice of the Peace, Lawyers, Insurance Companies, enterprises and private citizens. Provide services in the different ranges, as analysis and kinetic-kinematic reconstructions of car crash and accidents, insurance appraisals and damages indemnify, training courses and tutorials for road safety. Like may other technical activities, accident reconstruction has been revolutionized by the use of computers and specialty software. Various types of accident reconstruction software are used to recreate crash and crime scenes and to perform other useful tasks involved in reconstructing collisions. Accident reconstruction software is regularly used by law enforcement personnel and consultants to analyze a collision and to demonstrate what occurred in an accident. Examples of types of software used by accident reconstructionists are CAD (computer aided design) programs, vehicle specification databases, momentum and energy analysis programs, collision simulators, and photogrammetry software. PC-Crash© (and PC-Rect©) software is to the best of my knowledge a very powerful example. 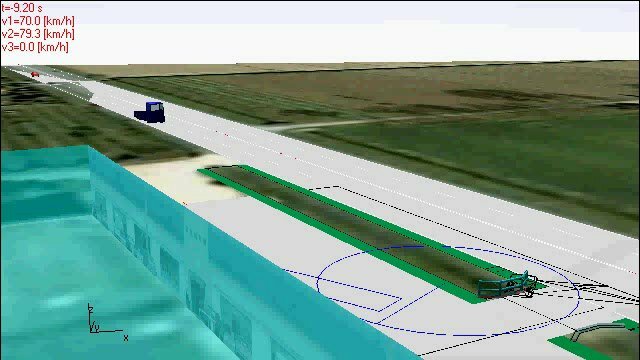 Example of dynamic reconstruction of car accident (2009), videoclip generated by a fixed location with software PC-Crash© (audio included). Il tuo browser non supporta video HTML5 ma lo puoi scaricare da ( www.infostra.it/VioCase090018aa.mp4). To see video-clips relating to various road accidents obtained with PC-Crash© go to Perizie Tecniche Ricostruttive.